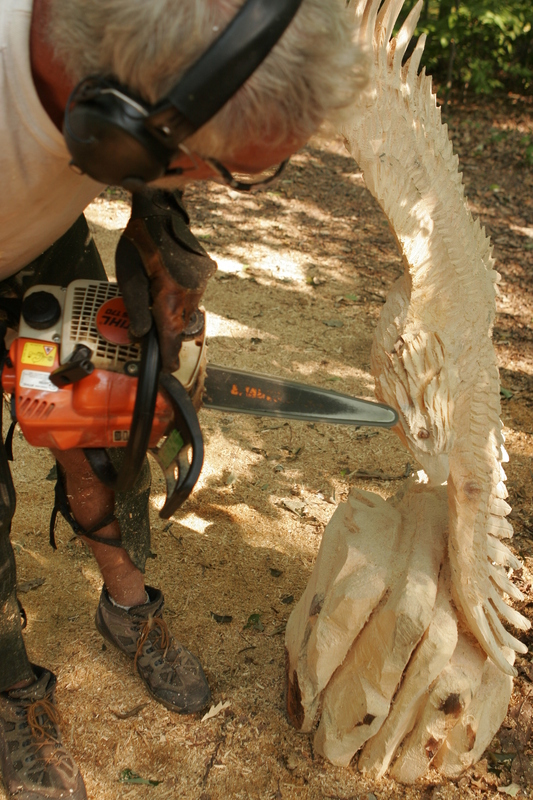 A few years ago, I took my husband to a workshop at Appalachian Arts Studio www.appalachianarts.com in Ridgeway, run by the same folks, Liz & Rick Boni, who put on the fabulous and successful Ridgeway Chainsaw Carving Rendezvous www.chainsawrendezvous.org in February. I was doing a story on the art classes they offer and while my kids took clay sculpture and lithography workshops, Todd took a few hours chainsaw carving workshop. Because he is an artist and can create almost anything he desires, whether it is a piece of fine furniture, a blacksmithed chandelier, or a chainsaw carving, he had one up on most students because we built a Scandinavian scribed log house. Carving all those hundreds of notches gave him a command of the chainsaw from the get-go. So after only a few hours, he took the ball and ran with it. 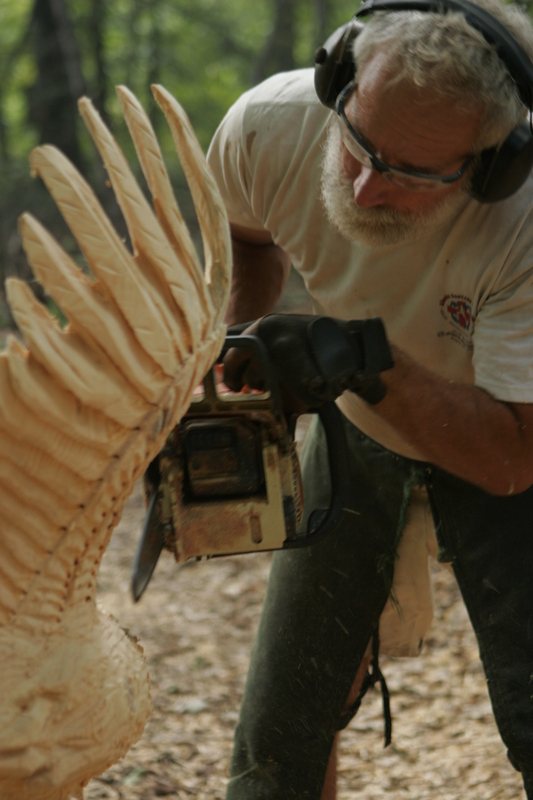 He has been creating chainsaw carvings ever since, and happily selling nearly everything he creates. His works appear at The Arts Barn www.theartsbarn.com outside Orwigsburg, here at our home and at various festivals around the state. 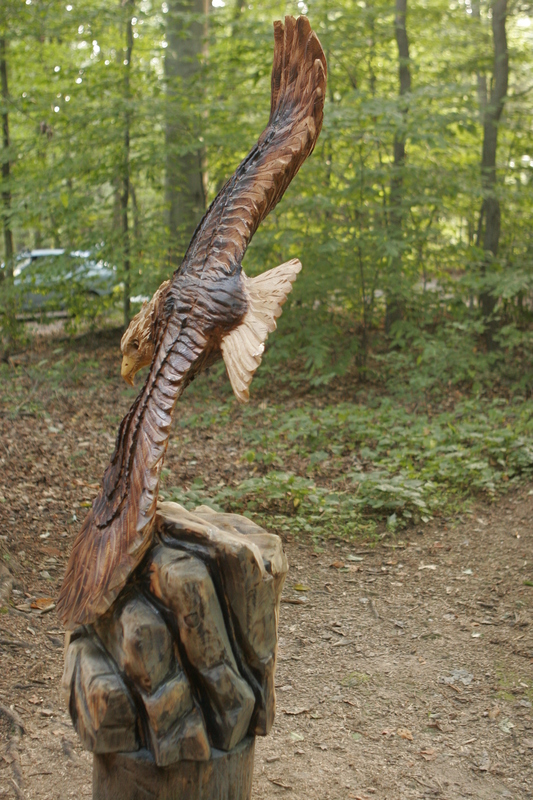 He will be carving at the Schuylkill County Fair this August www.schuylkillfair.com on Tuesday, Wednesday, and Friday (July 31, Aug 1, 3) and will most likely be there the other evenings too. Come see us. I have a quote here that will appear in an upcoming story that Bryce and I wrote/photographed for The Lion Magazine (International Lions Club). Here are also a few photos of Todd at work. 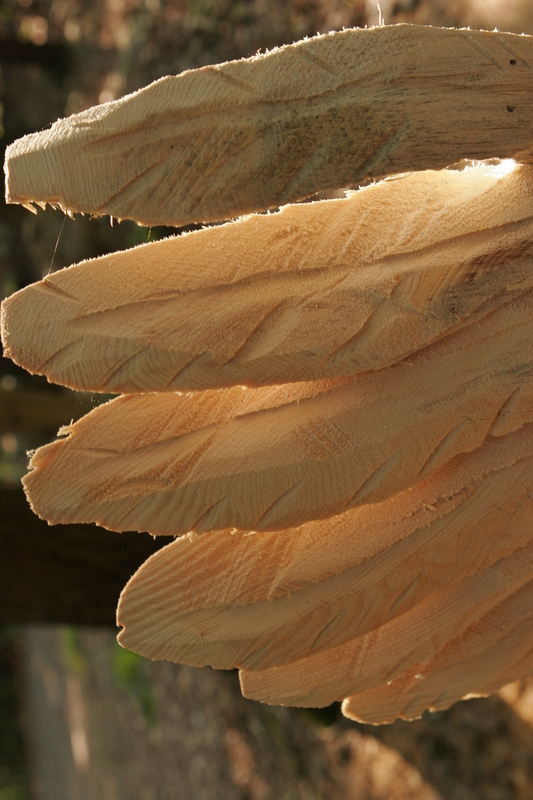 We can certainly attest to the skill with chainsaws as we have two such carvings at our home, one on permanent display outside that is from a tree we had trimmed. It is still rooted into the ground so no worries that it will ‘migrate’ with some help. 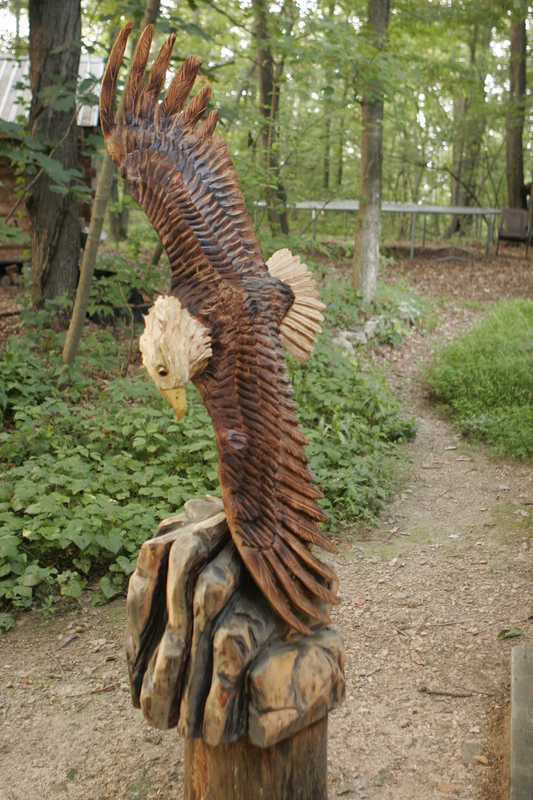 Excellent craftsmanship of a Bald Eagle in flight and the second is of a red fox curled up. The latter still fools us occasionally into thinking it is our cat curled up beside the couch! you guys are really kind and tremendous supporters- we thank you!